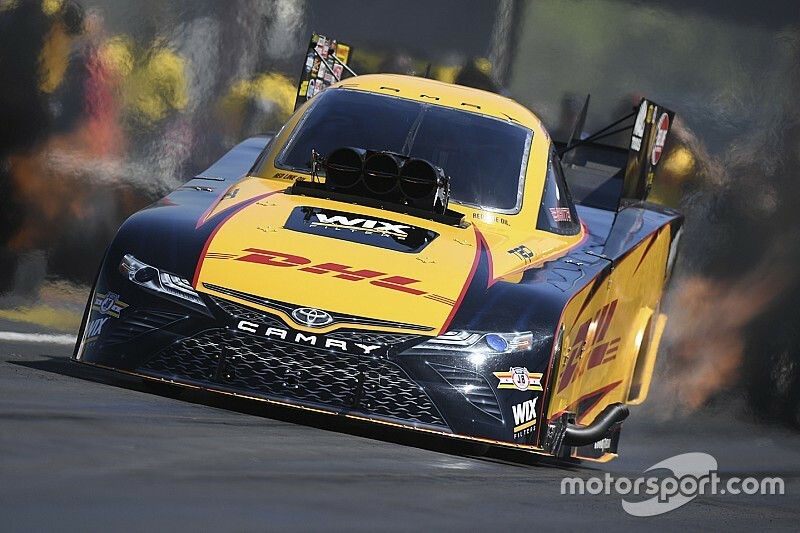 J.R. Todd clinched his first career NHRA Mello Yello Drag Racing Series Funny Car championship during the first round of eliminations Sunday at the Auto Club NHRA Finals at Auto Club Raceway at Pomona. Robert Hight, his closest rival and defending category champion, smoked the tires against Bob Tasca III during the opening round of eliminations which guaranteed the title crown to Todd. “People kept asking, ‘What do you need to do to clinch?’,” Todd stated. “I’m like, we need to win the race. We need to not worry about what we need to clinch it. Seeing Robert smoke the tires first round was instant relief. My crew was racing smart and the Yella Fellas do an awesome job preparing the thing today. They stayed focused all day long because there were a lot of distractions around our pit area and they did their job. Todd went on to dominate the season ending event with a run of 3.872 at 329.10 taking down the defending two-time event champion Tommy Johnson Jr.’s Make-A-Wish Dodge Charger R/T. He finishes the season with six race wins. Steve Torrence made NHRA history by sweeping all six playoff races during the NHRA Mello Yello Drag Racing Series Countdown to the Championship. He raced his Capco Contractors/Torrence Racing dragster to a holeshot win of 3.702 at 330.07 against NHRA’s winningest Top Fuel driver Tony Schumacher’s run of 3.700 at 331.61 in the final round. 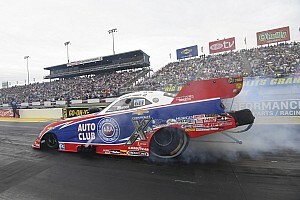 This is Torrence’s 11th win of the season, 27th of his career and first at Auto Club Raceway at Pomona. Torrence’s path to victory included wins against Cameron Ferre, teammate and father Billy Torrence and outgoing champion Brittany Force. Matt Smith secured his third NHRA Mello Yello Drag Racing Series Pro Stock Motorcycle championship in the final round of eliminations. 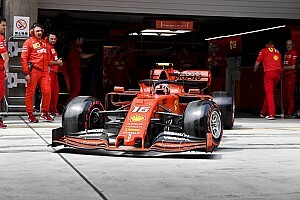 He powered his Elite Motorsports DENSO Auto Parts EBR to a 6.765 at 201.22 national speed record pass to defeat defending champion Eddie Krawiec, who was the nearest championship contender. M. Smith defeated Angie Smith, Hector Arana and LE Tonglet en route to the finals to secure the championship and event title. This is his first championship since 2013. Smith’s championship season had four race victories with three of them coming during the Countdown. Gray’s qualifying performance was enough to earn him the Pro Stock title and he went on to win the race in his Gray Motorsports Valvoline Chevrolet Camaro with a run of 6.519 at 211.86. That was enough to defeat Drew Skillman’s pass of 6.524 at 211.03. 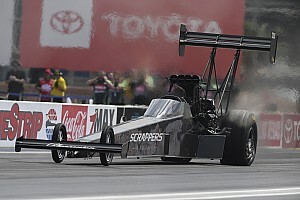 It was Gray’s eighth victory of the season, 13th of his two-year career and first at the Auto Club NHRA Finals. TOP FUEL: 1. Steve Torrence; 2. Tony Schumacher; 3. Brittany Force; 4. Blake Alexander; 5. Billy Torrence; 6. Clay Millican; 7. Antron Brown; 8. Bill Litton; 9. Doug Kalitta; 10. Mike Salinas; 11. Scott Palmer; 12. Richie Crampton; 13. Shawn Reed; 14. Terry McMillen; 15. Cameron Ferre; 16. Leah Pritchett. Final: Steve Torrence, 3.702 seconds, 330.07 mph def. Tony Schumacher, 3.700 seconds, 331.61 mph. FUNNY CAR: 1. J.R. Todd; 2. Tommy Johnson Jr.; 3. Jack Beckman; 4. Ron Capps; 5. Courtney Force; 6. Bob Tasca III; 7. Shawn Langdon; 8. John Force; 9. Cruz Pedregon; 10. Matt Hagan; 11. Tim Wilkerson; 12. Bob Bode; 13. Robert Hight; 14. Jeff Arend; 15. Jim Campbell; 16. Ray Martin. Final: J.R. Todd, Toyota Camry, 3.872, 329.10 def. Tommy Johnson Jr., Dodge Charger, 3.889, 327.51. PRO STOCK: 1. Tanner Gray; 2. Drew Skillman; 3. Jason Line; 4. Jeg Coughlin; 5. Bo Butner; 6. Greg Anderson; 7. Alex Laughlin; 8. Erica Enders; 9. Chris McGaha; 10. Shane Gray; 11. Deric Kramer; 12. Fernando Cuadra; 13. Vincent Nobile; 14. Matt Hartford; 15. Alan Prusiensky; 16. Kenny Delco. Final: Tanner Gray, Chevy Camaro, 6.519, 211.86 def. Drew Skillman, Camaro, Foul - Red Light. PRO STOCK MOTORCYCLE: 1. Matt Smith; 2. Eddie Krawiec; 3. Hector Arana Jr; 4. LE Tonglet; 5. Andrew Hines; 6. Hector Arana; 7. Jerry Savoie; 8. Angelle Sampey; 9. Chip Ellis; 10. Scotty Pollacheck; 11. Ryan Oehler; 12. Karen Stoffer; 13. Steve Johnson; 14. Joey Gladstone; 15. Freddie Camarena; 16. Angie Smith. Final: Matt Smith, EBR, 6.765, 201.22 def. Eddie Krawiec, Harley-Davidson, 6.812, 198.35. TOP FUEL: 1. Steve Torrence, 2,900; 2. Tony Schumacher, 2,596; 3. Clay Millican, 2,573; 4. Leah Pritchett, 2,456; 5. Brittany Force, 2,417; 6. Antron Brown, 2,378; 7. Mike Salinas, 2,308; 8. Doug Kalitta, 2,308; 9. Terry McMillen, 2,301; 10. Scott Palmer, 2,231. FUNNY CAR: 1. J.R. Todd, 2,726; 2. Robert Hight, 2,532; 3. Tommy Johnson Jr., 2,519; 4. Ron Capps, 2,510; 5. Tim Wilkerson, 2,418; 6. Courtney Force, 2,409; 7. Jack Beckman, 2,405; 8. Matt Hagan, 2,371; 9. John Force, 2,356; 10. Shawn Langdon, 2,285. PRO STOCK: 1. Tanner Gray, 2,758; 2. Jeg Coughlin, 2,571; 3. Drew Skillman, 2,559; 4. Erica Enders, 2,525; 5. Jason Line, 2,472; 6. Vincent Nobile, 2,452; 7. Greg Anderson, 2,418; 8. Bo Butner, 2,379; 9. Deric Kramer, 2,268; 10. Chris McGaha, 2,184. PRO STOCK MOTORCYCLE: 1. Matt Smith, 2,666; 2. Eddie Krawiec, 2,627; 3. Hector Arana Jr, 2,536; 4. LE Tonglet, 2,532; 5. Jerry Savoie, 2,464; 6. Andrew Hines, 2,450; 7. Angelle Sampey, 2,349; 8. Angie Smith, 2,303; 9. Steve Johnson, 2,290; 10. Scotty Pollacheck, 2,258.